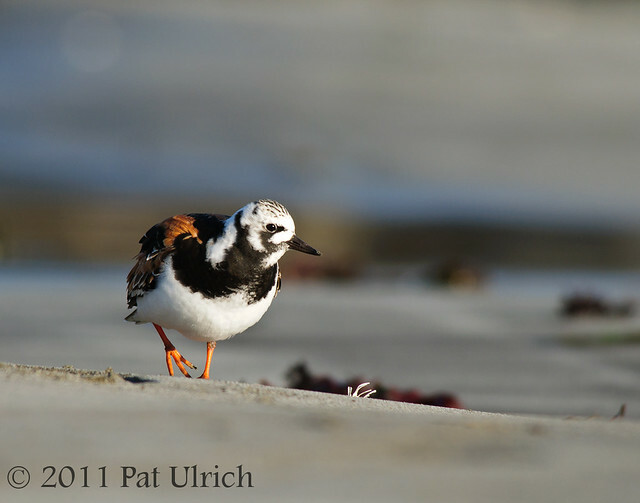 A ruddy turnstone in breeding colors at Pillar Point Harbor. Here the bird is running across an exposed area of sand between the rocky formations that it seemed more comfortable near. 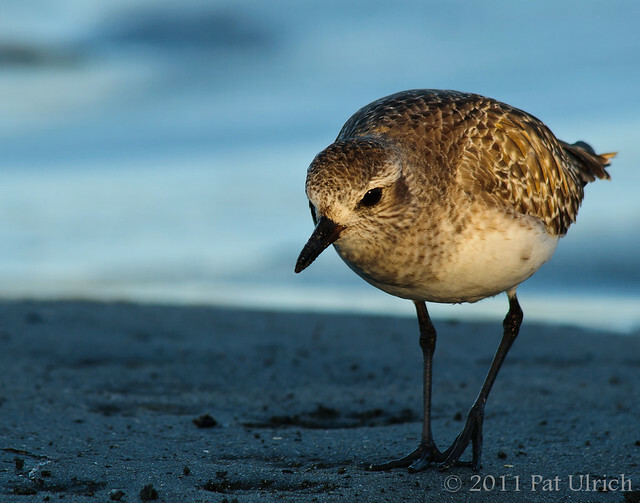 These shorebirds have such a stocky shape to them, right down to their thick legs. Their feet are pretty interested too, seemingly larger than other birds their size. Between these two shots, I like that the feet came out sharp in the bottom frame, but the head angle in the top frame makes it a stronger image, in my opinion, even though I clipped off the edge of the tail feathers. 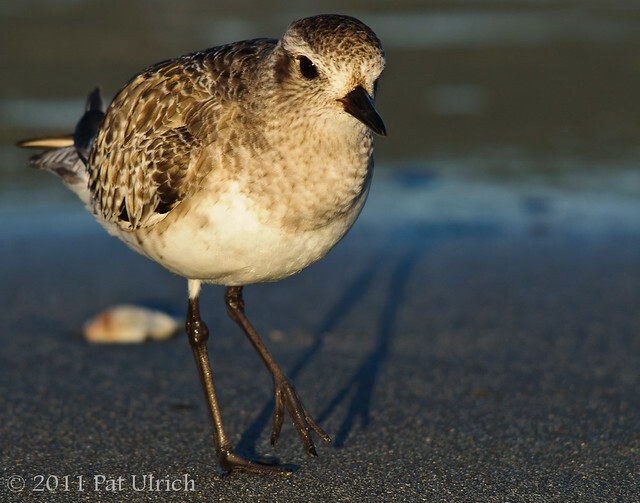 A western sandpiper in transitional plumage takes a stroll along the water's edge at Pillar Point Harbor. I've had a few comments recently that have asked about my strategy for photographing shorebirds at eye level in sandy environments. In terms of approaching birds, the further away you start belly-crawling from the better. However, since they don't always stay in the same spot for too long, you need to balance where you start with the time it will take you to get to where you want to go. I find it helpful to watch an area for a while so see where there is a lot of activity. Then I'll try to crawl into a position where I expect the birds will be heading next. For example, if they are working their way up the beach while feeding, I'll get ahead of them, pick a spot in the sand and lay down to wait for them to come to me. If they do come all the way to your spot, then you can get great close encounters since they've approached you on their terms, but sometimes I'll guess wrong and they'll head in a different direction before making it to me. But when I pick the right spots, I'll stay on the ground for as long as the birds hang around me (sometimes for as much as an hour in one place). It's also really important to move slowly, both while getting into the prone position as well as while crawling to the birds. While I feel a little strange dropping into a kneeling position in super-slow motion, if you move normally from standing to kneeling, the birds will often take flight. So it's a slow-motion drop to my knees, then putting the tripod flat on the ground, and then a slow-motion drop to laying in the sand. At that point, the birds are much less wary, so I'll take a minute or two to assess the scene again before starting to crawl to my next location. I find it particularly helpful to crawl forward only a few yards at a time, then stop for a few minutes before proceeding. Once you've spent a good 10-15 minutes in the sand with birds, they'll often stop paying much attention to you, and then the fun really begins! In terms of protecting my gear, I always have my camera on the tripod, with the legs spread out flat on the ground. This keeps the camera itself a few inches off of the sand. My tripod has taken a real beating this way, with plenty of sand ground into the joints, but it still works! Then I try to make a conscious effort to not touch the sand with my hands while crawling or getting up. This is especially important since my entire body will more or less be covered with sand by the time I stand up again, so there aren't too many places to wipe off my fingers. On windy days, I'll pull out my Vortex Storm Jacket camera cover, which works great for keeping the blowing sand off of the camera, as well as rain. It's inevitable that I'll get sand somewhere that I don't want it, but for the most part I can wipe it off when I'm done with no real damage incurred. 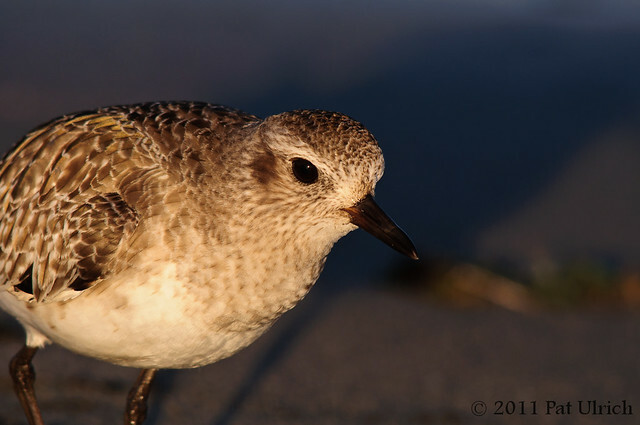 Shooting shorebirds from eye-level at the beach is one of my favorite activities, adn there are plenty more images of peeps in my Shorebirds Galleries. 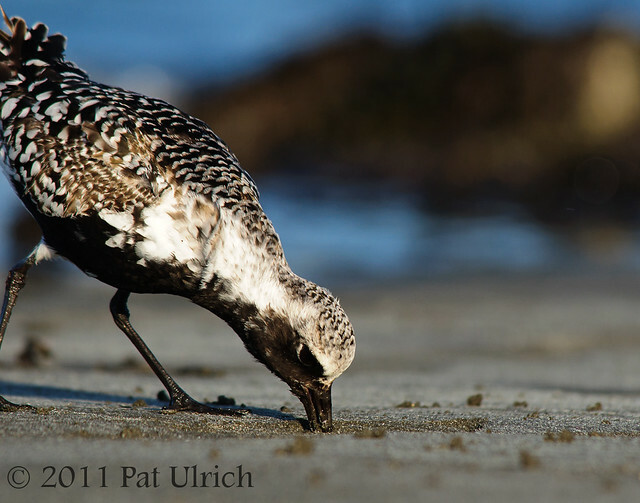 A black-bellied plover in breeding plumage studies the surface of the sand for signs of a meal below. Image taken at Pillar Point Harbor on Half Moon Bay. 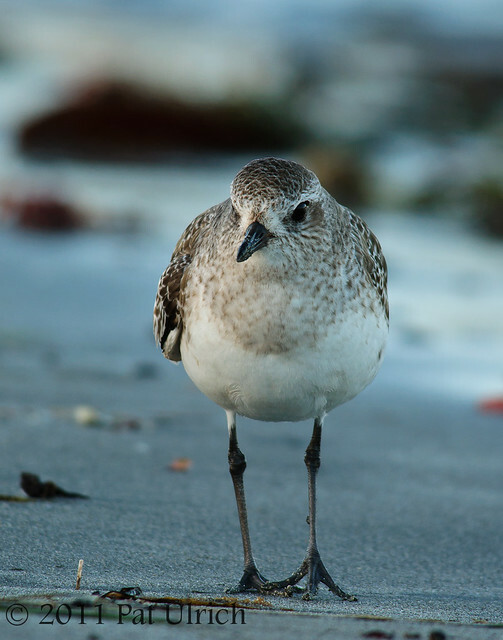 See more in my Plover's Gallery. 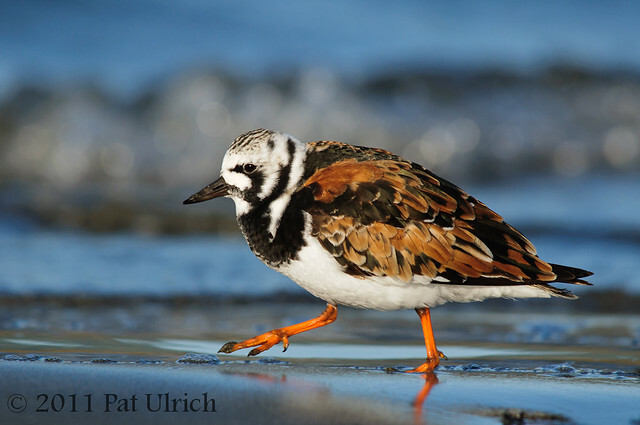 A ruddy turnstone strolls through the sand in Pillar Point Harbor near Half Moon Bay, California. 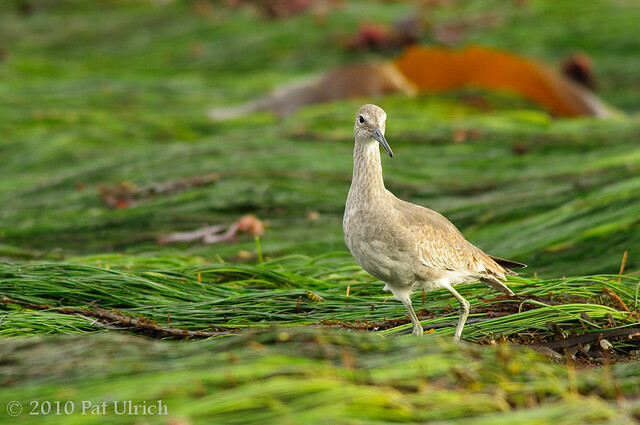 These birds are so stunning in their summer colors, and it was a treat to have a few unexpectedly stroll in front of my lens while I was laying in the sand photographing other shorebirds. 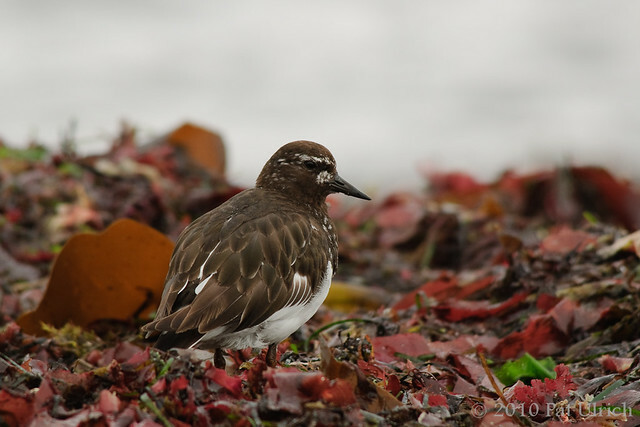 View more in my Turnstones Gallery. 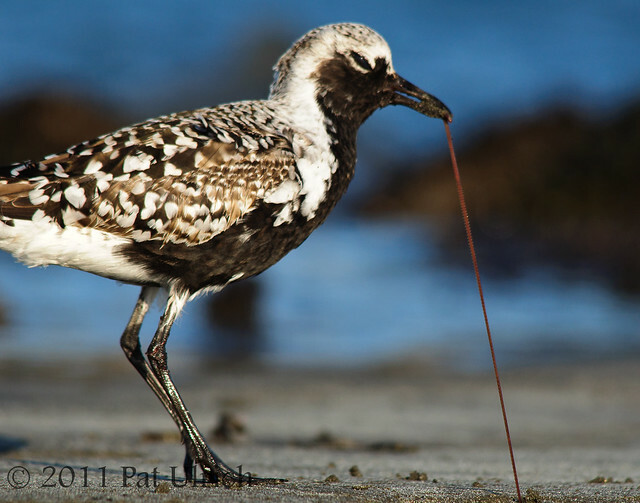 A five-frame series of this black-bellied plover pulling a segmented worm from the exposed sand of Pillar Point Harbor on Half Moon Bay. I've watched black-bellied plovers pull many of these worms from the sand, but this is the first time my photographs left me reasonably (although not fully) satisfied. The birds will stalk around looking for a tip of the worm in the sand, then freeze, stare at it for a moment or two, and then strike. As it starts to pull the worm from the ground, I often marvel at how long these critters are, and how many there must be just underfoot. Most of the time the worm seems to pop out of the hole by the time the plover is back to full-height, but this particular meal was longer than expected. The plover pulled, and pulled, and seemed to be preparing for the worm to come popping out of the sand. It's eye was half closed, and I can't help but wonder if it expected the worm to come flying at it like a rubber-band that snaps under tension. For the last frame the plover pulled even further out of my plane of focus, but yet the worm still hung onto its burrow. Moments later the plover took its prize, and it was fun to watch it attempt to eat it like a long string of spaghetti. 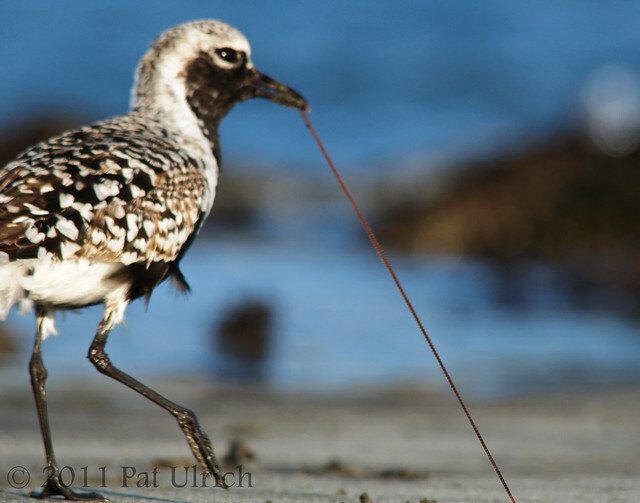 View more images of these charismatic shorebirds in my Plovers Gallery. Submitted to World Bird Wednesday -- Follow the link to see this week's posts! 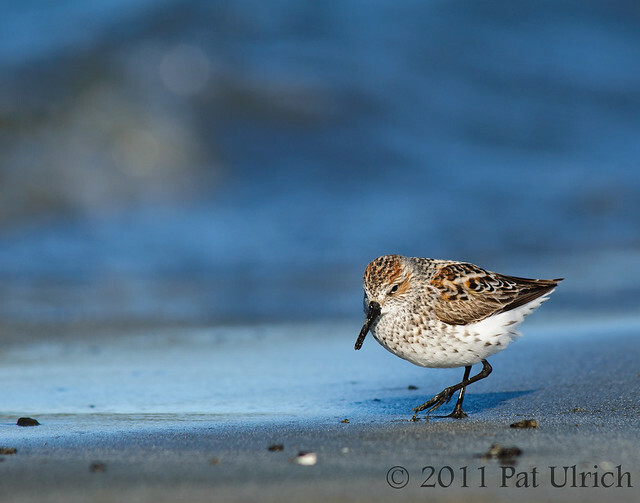 A western sandpiper feeding in Pillar Point Harbor on Half Moon Bay. 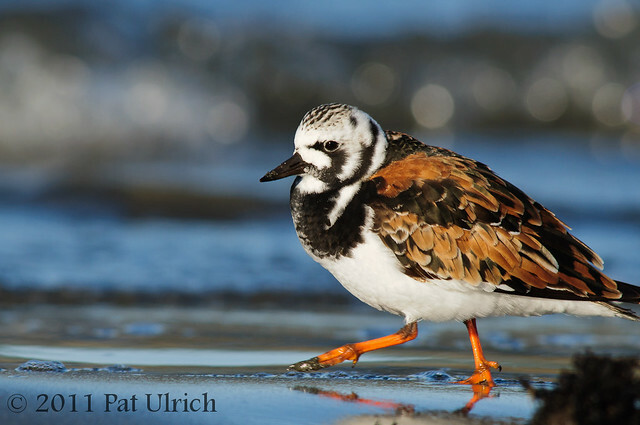 It's a wonderful time of year to be out looking for shorebirds, since they are all transitioning into their breeding colors. This means that normally drab brown and grey birds show splashes of bright colors as they prepare to migrate north to breed on the tundra. 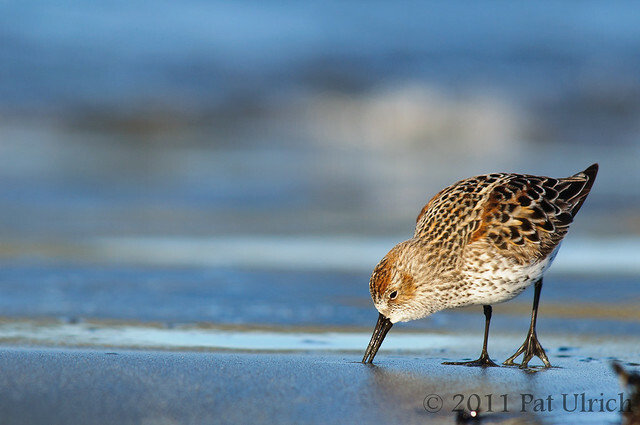 View more shorebirds in my Sandpipers Gallery. 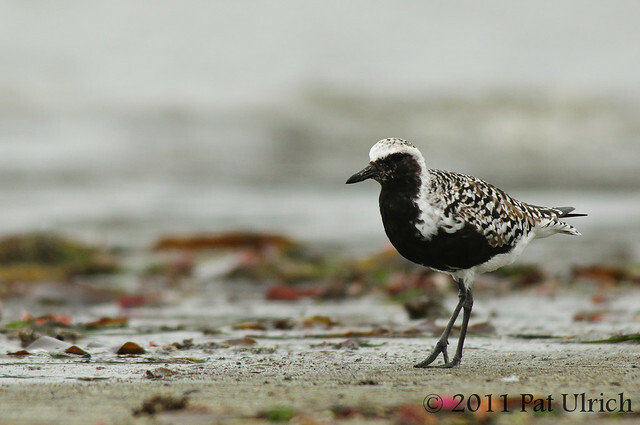 A black-bellied plover, in the middle of transitioning to its summer plumage, along the edge of the water at Pillar Point Harbor. Updated caption: As many of you have guessed, I intentionally left out the story of this picture to see what reactions it would get. The story is that yes, that is a real shark in the background. It was about a 2-3 foot long leopard shark, which is one of the most common sharks in the coastal areas of CA. It's a sleek, long-bodied shark with a beautiful spotted pattern that will often come into intertidal areas during high tides to feed. Unfortunately, this particular shark was not doing well. It was clearly very near the end of its life, and was getting rolled with the waves at the edge of the shoreline. I normally wouldn't photograph an animal in that condition, but when the plover I was following stopped in front of it I couldn't help but fire off a few shots of this unique composition. On our walk out of the harbor, we saw another related intertidal predator, which was in much better shape -- a bat ray was feeding on the newly covered sediments. It was really fun to watch its two fins break the surface as it flapped its "wings" and cruised along in the shallow water. 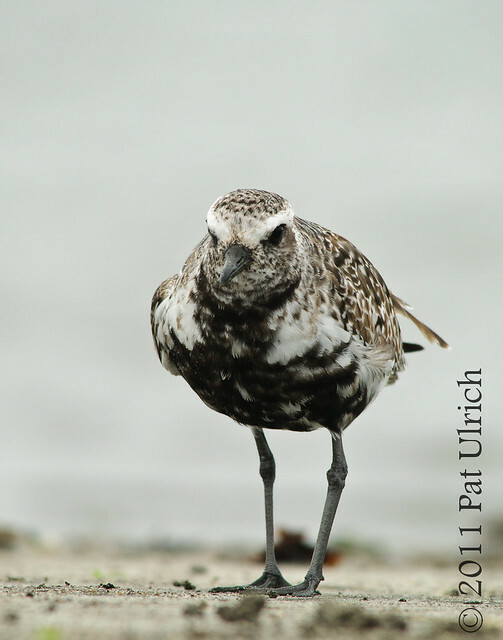 A black-bellied plover that is almost to its full breeding plumage. They are such stunning birds in their summer patterns, and it's a pleasure to get to see them transition into that phase along the California coast. It's pretty cool to think too, that earlier this spring, they looked like this. I was hoping for nice high overcast clouds yesterday evening at Pillar Point, but instead we got nearly ground level fog which left my images a little drab. But anytime you get to be close to shorebirds is worth it in my book, and I tried to make the most of the gray-scale scene. Not all of the birds were as dark as this one yet, so I hope to head back in a week or two to try for some nicer light! 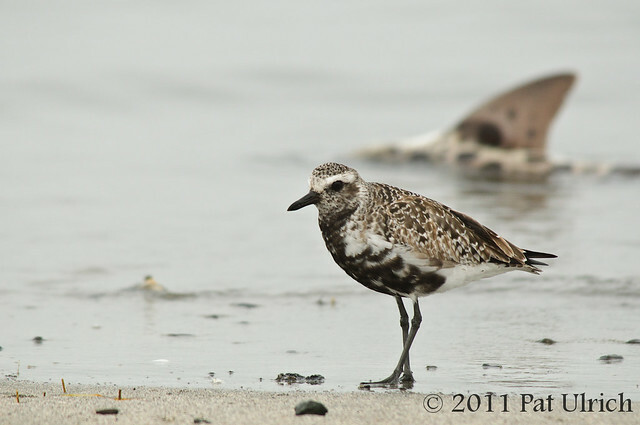 Two more shots of this very friendly black-bellied plover at Pillar Point Harbor on Half Moon Bay. As the sun was dropping lower in the sky, the shadows stretched longer, and really elongated the look of the lengthy legs of this shorebird. Submitted to World Bird Wednesday -- Click the link to check out this weeks posts! 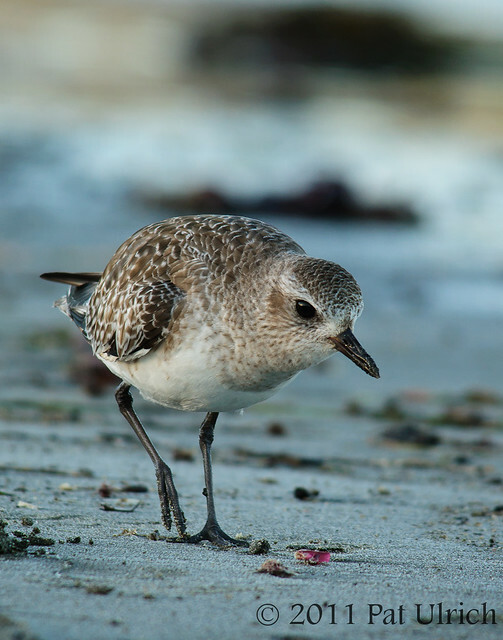 I took so many shots of this individual plover as we spent over an hour together on the beach at Pillar Point Harbor last month, and I have a lot more to edit and prepare for uploading. 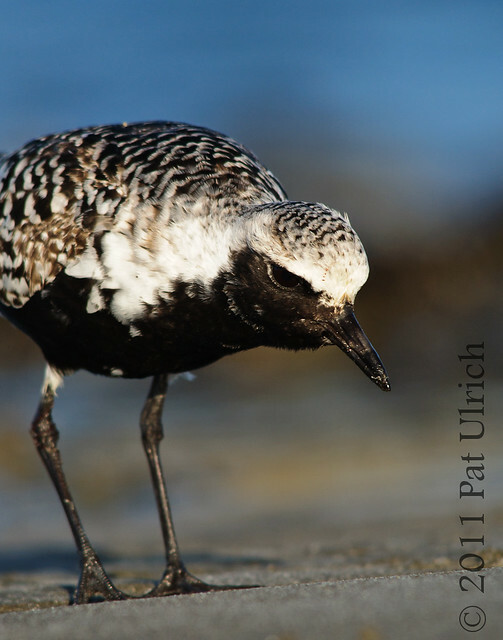 Before this experience I had always found black-bellied plovers to be rather skittish. However, this one was really successful at pulling up worms from the sand, and it seemed to be so focused on the task at hand that it could care less about the photographer tagging along behind. 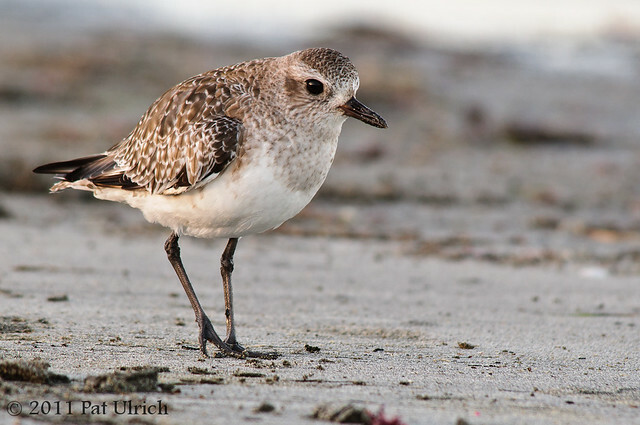 I spent over an hour with this single black-bellied plover as it combed the shoreline looking for a late meal. We were along the edge of the water inside of the harbor, and eventually the sun sank low enough to be mostly blocked by the seawall behind me. This left us in a world of cool blue tones, except for a few rays of light that were still shining through from low-points in the wall. The plover was eyeing something up in the sand as it walked into one of these rays, which gave me a nice opportunity to capture it bathed in warm sunshine against the cool, shaded background. Submitted to World Bird Wednesday -- click the link to see this week's submissions! A western grebe swimming through striped reflections in Pillar Point Harbor near Half Moon Bay. 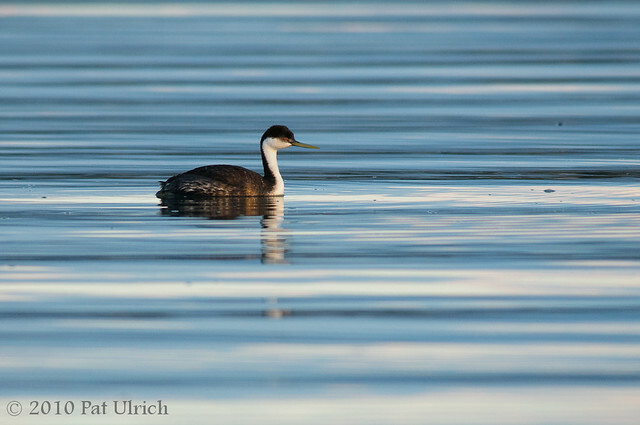 This shot is from last November, but this is in honor of the pair of grebes that we saw doing their mating dance at the Berkeley Marina recently. It's a spectacle that I've wanted to witness ever since I saw it on Life of Birds. While I didn't get a chance to photograph it this time (it happened quickly and too far off) it was cool to see the birds mimicing each other's movements, and then take off together to "run" on the water! 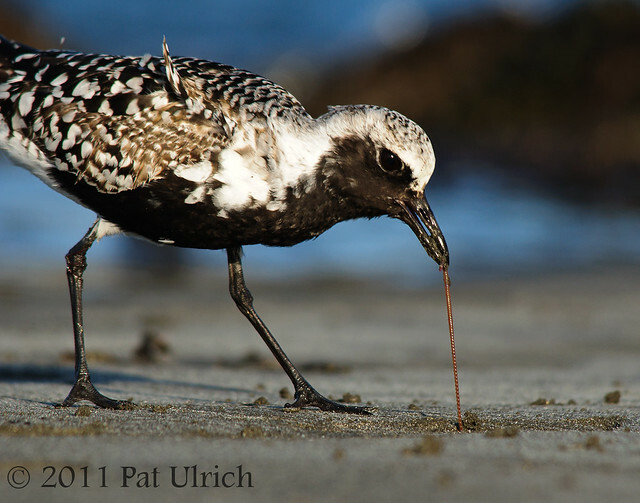 A black-bellied plover hunting for worms in the sand at Pillar Point Harbor on Half Moon Bay. There was surprisingly little in the way of birds along the shoreline on this particular evening, but I did manage to make a tentative friendship with this plover. After watching it pluck a number of worms from the sand before sunset, I was able to work my way in close and gain its trust. I followed it up and down the beach a number of times as it ran back and forth, and on a few occasions it came so close that I couldn't keep the whole bird in the frame. 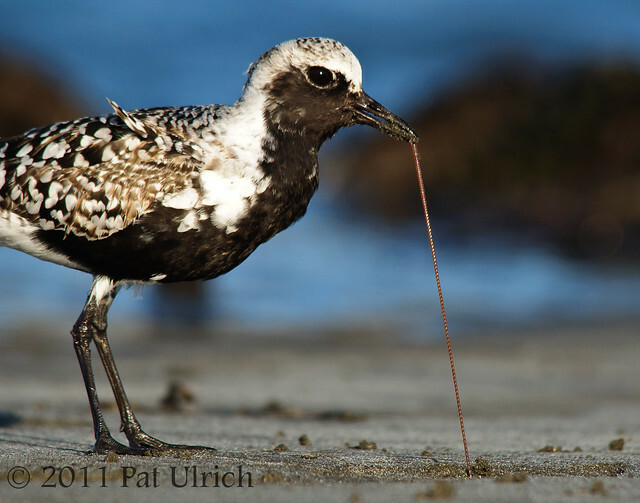 No complaints here though -- it's always a pleasure to have the chance to spend some quality time with a shorebird! Intertidal zones are fascinating places to observe nature as they are constantly in flux. The intertidal reef at Pillar Point Harbor on Half Moon Bay is a terrific place to explore during neap tide cycles, especially during a negative tide. You never know quite what to expect, but the birds are great at this locale, and its a fun place to see them in a different setting. Last November we took a trip there for a sunset that coincided with a large negative tide, and were greatly rewarded with some interesting wildlife. We even saw a very small octopus that was stranded in a tidal pool near shore, which was a real treat! The top two shots in this post are two of the many willets that were cruising the reef looking for easy prey to pick off. The top shot is of a curious bird that came over a rise and seemed surprised to see me. They look so crazy from straight on, don't they? The reef was completely different this time compared to when I was last there a little over a year before that. On that trip, in August of 2009, the intertidal zone was not covered by seagrasses like it was this time. Instead, as is shown in the shots below, there was a really fascinating covering of these bulbous pods all across the reef. 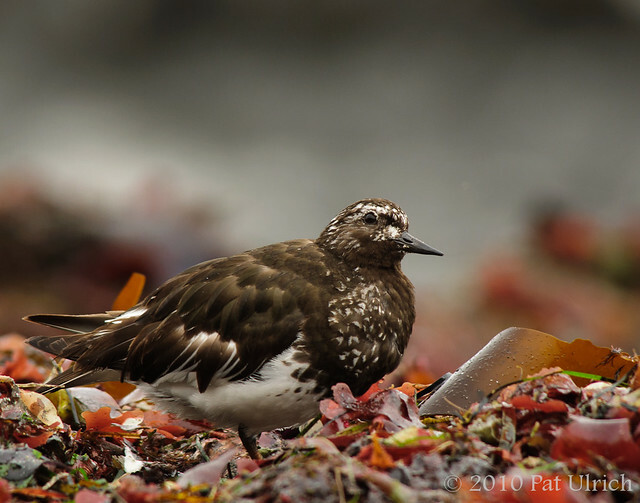 It was really a surreal landscape, and it was fun to photograph birds, like this black turnstone, in such a weird setting! It also happened to be quite foggy that morning, which added another layer to this mysterious landscape. Although the birds seemed to be quite at home in this alien-like world. Submitted as part of the World Bird Wednesday -- Follow this link to see the submissions for this week! 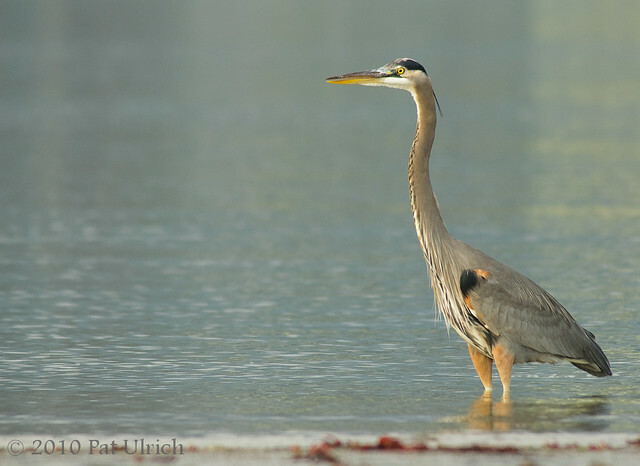 This great blue heron was hunting out on the mudflats of Pillar Point Harbor last November. 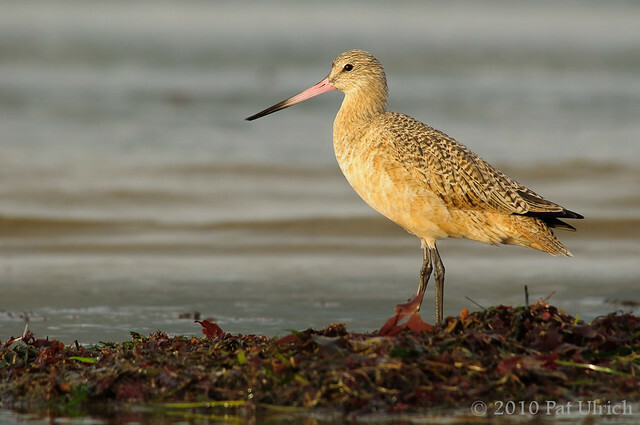 A marbeled godwit in late light at Pillar Point Harbor on Half Moon Bay, California. 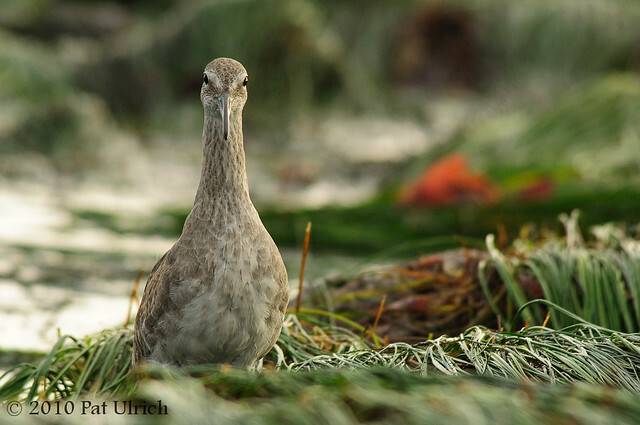 A western willet scanning the mudflats at low tide for a meal. 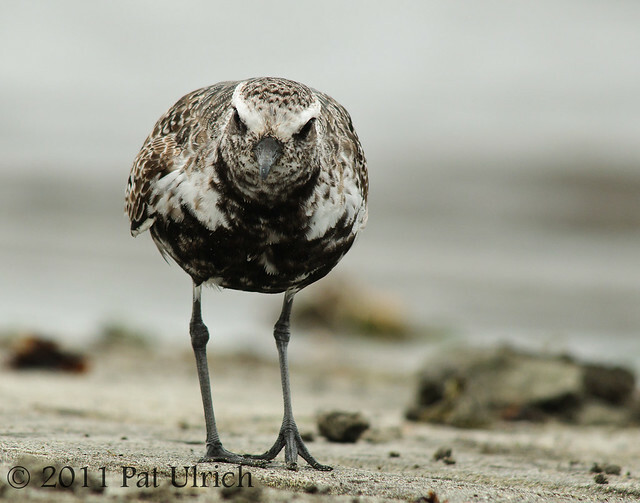 This is not the usual way I display shorebirds, but there's something that really pulls me into this particular straight-on view. I think its the eyes, and how they are unexpectedly focused forward, which is not how we usually see birds. 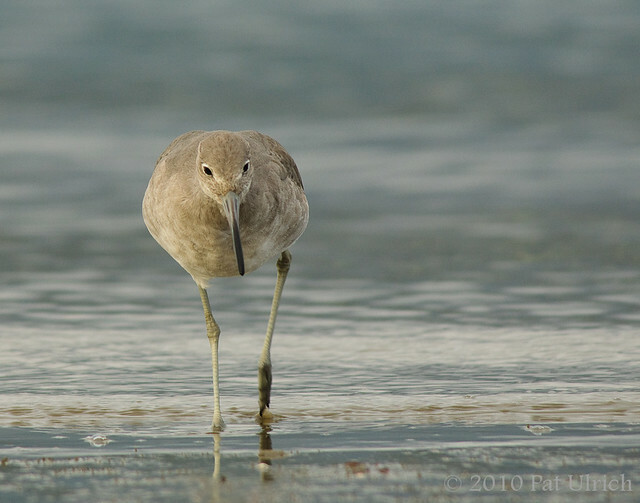 From this perspective, the placement of the eyes makes the willet seem much more predatory than when its viewed in profile. Taken in Pillar Point Harbor during a negative low tide, with plenty of mudflat exposed. Even when everyone is running in one direction, sometimes its not a bad idea to take a step in the other. Sanderlings on an overcast evening at Pillar Point Harbor.